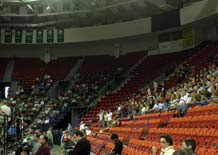 Just last week, McCain-Palin packed the house at the Resch Center. Obama on Monday?… Not so much. The streets were packed with McCain-Palin supporters.